Starting at $16,812. 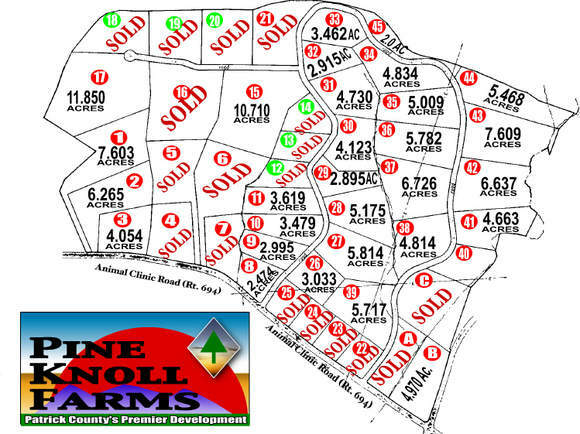 Wooded and open tracts range from 2.4+/- acres to 7.6+/- acres. Some have a stream, some have a view. Private and convenient location. Buy adjoining tracts to get more acreage. Restricted to stick built or modular homes. Horses Permitted. Directions: From Stuart, take Rt. 58 East, turn left on Animal Clinic Road, go aprox. 1.5 miles, property on left. Watch for signs. The road into Pine Knoll Farms has been surface treated with tar and gravel. Some tracts have open land and stream.